Robotic welding has brought tremendous advancements to the welding and automation industry. In this article, we explore the different facets of robotic welding. Welding has always been the number one application for industrial robots since robotic laser welding was invented. According to Assembly Magazine 50 percent of all of the world’s robots are used for welding. Robotic welding is the typical method for automating the welding process. The robot can be as simple as a single axis motion for straight or circumferential welds to as complex as a seven (or more) axis robot that would work within a large envelope following complex weld path geometries. The welding process could include, MIG, TIG, laser, resistance or a combination of welding processes. 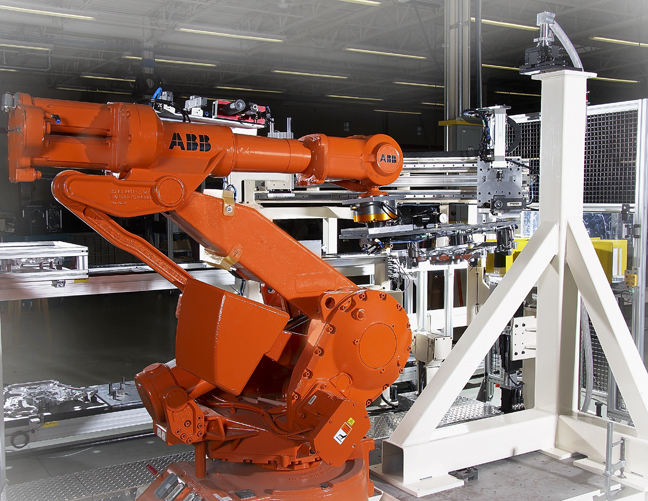 Many robotic weld systems also employ additional robotic material handling or robotic assembly processes. What is a robotic welder and what does it look like? A typical robotic welder would be a six axis industrial robot dressed out with a welding package including the torch, wire feeding and shielding gas delivery systems. This can be referred to as process to part. Often the product is located in hard fixture and clamped on a dial table/rotary transfer machine this allows for the loading and unloading of the product and can inherently provide protection to the operator loading the product from weld sparks and flash. Robotic welders also service larger systems where the part itself, such as a vehicle body component, would be moved into position for the robotic welder to work on. In a part to process system the weld equipment remains in a fixed location and the fixture part is moved to the welder. One of the biggest advantages of robotic welding is safety. Robotic welding removes the human operator from the heat, sparks and fumes of the welding process. The typical advantages of automation apply to robotic welding; a 24/7 work force that will work with the lights on or off and do not require sick days or vacation. However the deeper advantages include more consistent weld paths and weld penetrations. In the case of spot welding; robots allow the complex repeatable positioning of large transguns. Robotic welding technology continues to advance to empower the user with quicker welding and improved safely. Advancing weld technologies allow finely modulated energy patterns for better control of heat for the weld application. Other advanced welding technologies include seem tracking or seem finding to allow successful welding to occur on interfaces with wider tolerance ranges. Interestingly, laser welding is one of the fastest growing applications for robots in the automotive industry. With pressure in the automotive industry to continually reduce the weight of a vehicle, laser welding has been able to assist in these goals. Laser welding can also produce more heat, allowing the use of a diversity of metals and thicknesses. The human welder still carries the torch (pun intended) when it comes to super large structures (e.g. buildings, ships and aircraft). Human welders are also more capable of working with less accurate interfaces, e.g. where gap filling is required. How are robotic welders used in automated assembly and what types of projects do they work on? Robotic welding can be achieved by manipulating a part around a fixed or moving weld gun, or manipulating a weld gun around a fixed part, depending on what suits the process. In order to achieve cycle time, often a “marriage station” will be the first step, which will set the overall geometry of the final product. Subsequent weld stations will process the additional structural welds. Robotic welding is best utilized in processes where there is well defined GD&T to allow proper, repeatable fixturing of the components. For some weld systems, robotic welding is very well suited for complex or large assemblies that requires significant amounts of manipulation of the weld gun relative to the parts being welded. How does Innovative Automation use robotic welding? Robotic welding can be used in a huge diversity of applications. Innovative Automation builds robotic welding solutions for small and medium sized products from automotive seating components and structural subassemblies to woodstoves and even some post weld process on the kitchen sink! If you are ready to get started on your next assembly project and would like to learn more about how robotics assembly can help streamline the process, contact us today.